On Tuesday, the Twins announced that they had acquired middle infielder Daniel Ozoria from the Los Angeles Angels of Anaheim. In exchange, the Twins sent hard-throwing reliever John Curtiss who had been designated for assignment a day earlier to make room for Blake Parker. Today you can get to know a little more about the newest member of the Minnesota Twins organization. Below you will find a profile for Daniel Ozario in the form that is found in the 2019 Minnesota Twins Prospect Handbook. There is header information with the bio information as well as his 2018 statistics. Tom Froemming wrote up his 2018 recap, as he did throughout the Prospect Handbook. I wrote up the background information and the scouting report as well as the 2019 projection. Have you purchased the 2019 Minnesota Twins Prospect Handbook yet? If not, why not? There are over 160 of these profiles for the Twins minor leaguers. There are feature stories on the Twins Daily 2018 Minor League Award winners (Alex Kirilloff, Tyler Wells, Andrew Vasquez), and more articles from the likes of Dan Hayes, Chris Blessing, Ted Schwerzler, Cody Christie and Tom Froemming. There is also an article about each of the Twins top five minor league affiliates that are enjoyable. Plus, you get the Top 30 Twins prospect rankings from Cody, Tom, Jeremy Nygaard, and myself. Plus, you can look at my Top 30 Prospect rankings going all the way back to 2015, if only to mock and ridicule me. Background: Ozoria grew up in the Dominican capital city of Santo Domingo. While he was not big, scouts saw a young player with great baseball instincts and the ability to play shortstop. He was about as young for the 2016 international signing period as possible. At the time, he was about 5-foot-9 and less than 135 pounds. He made his professional debut in 2017 in the Dominican Summer League where he hit .247/.332/.301 (.633) with six doubles and three triples. He participated in the Angels Instructional League in 2017. 2018 Recap: Ozoria spent all but two games of his 2018 season with the Angels' Arizona League team. He was very young for his level. Not once all season did Ozoria face a pitcher who was younger than he was. He was tested, and the numbers show it. The diminutive Dominican tallied just four extra-base hits in 217 plate appearances on the season. In the field, Ozoria made 33 appearances at shortstop, 13 at second base and five at third base. Scouting Report: If you look at his biographical information on most baseball sites, it will still show him at about 135 pounds. In the two years since signing, he has added some size and strength and is now up to about 150 pounds. Clearly he will have to continue to grow and add strength over the coming years, but the skills and the tools are there. Again, Ozaria is a real good defensive player. He’s got good hands, and good range. He’s also got a good arm, though strength should help his arm improve to above average. Right now, Ozoria has a nice, smooth swing that can produce line drives from gap-to-gap. The Twins took a flyer on Ozoria, and they will certainly need to exhibit a lot of patience. Forecast for ‘19: He will start the season at extended spring training and likely stay in Ft. Myers and play for the GCL Twins. One comp that I have heard is Engelb Vielma. If the Twins can turn a DFAd player (Curtiss) into a guy who gets to the big leagues, the player development would deserve a ton of credit. Best case scenario… he could become a Dee Gordon type of player. That would work, right? I’ve always been told that statistics matter much, much more in the upper levels than the lower levels. In the DSL or the rookie leagues, statistics all need to looked at, but the stats mean less than the tools. So, the fact that he hit .195 in rookie ball as a 17-year-old isn’t something that should scare anyone away. Again, if you haven’t already, pick up a copy of the 2019 Minnesota Twins Prospect Handbook today, available in paperback and for immediate PDF download. Wish we could re-do the trade and keep Curtiss. Chances are good that the Twins regret this move. Stats don't matter much? Maybe that is meant to temper expectations of "good" stats.But if they are already tanking, and really tanking, even in rookie ball..... that matters to me. 135-150 lbs? I have wet socks that weigh that. Another disturbing thing is that Ozoria was born 'in the year 2000.' Are we really already to that point in time when prospects were born in 2000? Time flies, dang. Tom's write up says he bats left handed....the photo has him batting right handed. Switch hitter?? One comp that I have heard is Engelb Vielma. I think that Vielma's arm seems to be a bit better, but Ozoria's bat projects better than Vielma's. As a 17 year old foreign born prospect, he was younger than the competition. He was a High Schooler playing against College age competition. the average GCL position player is something like 19 and a half. There is a big difference between a 17 year old and a 19 year old body. The stats made me take a little double take but they don't really concern me much. Dominican shortstop Daniel Ozoria turned 16 on Aug. 24, making him one of the youngest players in the 2016 class. Had he been born more than a week later, he would have had to wait until 2017 to be eligible to sign. 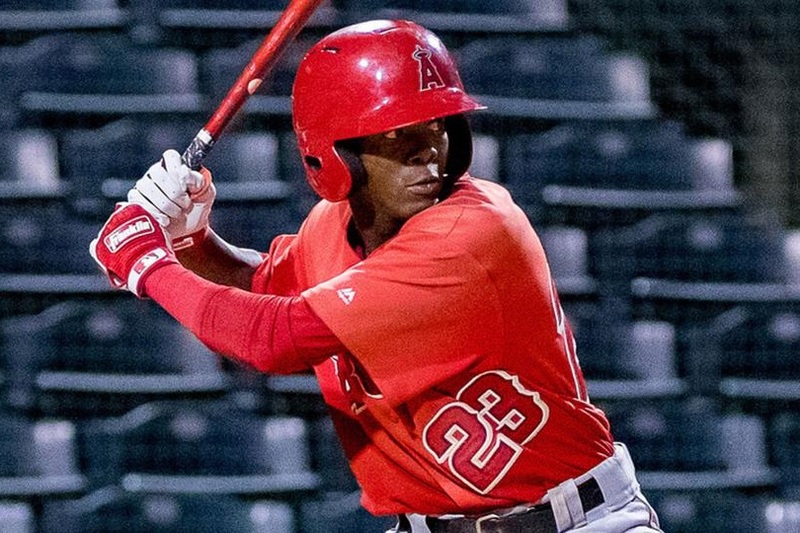 The Angels added Ozoria shortly after his 16th birthday on a $125,000. His youth shows in his extremely thin, underdeveloped frame at around 5-foot-9, 135 pounds, but the actions and instincts are there for him to play shortstop. Ozoria has clean hands, a nose for the ball and can make throws on the run from different angles with an average arm. The biggest thing for Ozoria will be getting stronger, which should help his tools, including his arm and fringy speed, improve. That process could take time though, and might hold him back initially at the plate, but he does make contact against live pitching. Ozoria trained with Felito Cueto. The way I see it, this is basically a free lottery ticket. The Twins were going to lose Curtiss either way. Nice to see they got something for him, though it's not like Ozoria would crack my top-50 Twins prospects or anything like that. Why would they regret this? They DFA'd him to clear a roster spot. They were willing to lose him for nothing. Anything they got is a freebie. I think his argument was we could have let someone else like Magill go instead of Curtiss. I know I'd rather have Curtiss that Magill. Appears to be low level filler fodder and just something to allow the Angels to avoid the claim line. I wish they would have kept Curtiss and dumped Duffey. But, once we get passed that, realizing that they got someone for a DFAd player is a positive. As others have said, it's kind of a lottery ticket. Most likely, he won't' get to the big leagues. He may not get out of the rookie leagues. But, maybe he grows and figures out how to get to 160-165, and maybe he can be Alexi Casilla. Maybe he could be Matt Tolbert. Maybe he can be Dee Gordon. We''ll know more in 3-4 years. They've probably got a good idea which guys on the fringe of the 40 man are worth something in a trade, and those that are not.Chances are high that none of those fringe guys will be on the roster when camp opens, let alone by mid-season.When they sign Machado (right!) someone else will get DFA'd, but probably not traded. Ozoria is much more intriguing than nothing.Again, they got Parker and Ozoria for Curtiss. Again, they got Parker and Ozoria for Curtiss. And the Angels seem happy with Curtiss for Parker and Ozoria plus the money saved. I'm especially interested in knowing their views on why they see this as to their advantage. Not that they're going to say. And the Angels seem happy with Curtiss for Parker and Ozoria. I'm especially interested in knowing their views on why they see this as to their advantage. Not that they're going to say. Well, they have a good track record with reclaiming hard-throwing but wild pitchers from the Twins.See: Alex Meyer. We're just a bunch of old farmers sitting around the coffee shop in the cold of winter, arguing about the price of combine parts.The Lukewarm Folgers League. We're just a bunch of old farmers sitting around the coffee shop in the cold of winter, arguing about the price of combine parts. The Lukewarm Folgers League. Lol. That made me laugh out loud on the train. Yet Zach "throw it to a base where nobody is" Granite is still deemed needed, when he could have been DFA'd. Go figure. Yup. Gives Twins fans another player to talk about for 5-8 years before he is released or dumped. Intriguing, but probablay a huge waste of time. For those saying this is a lottery ticket:LOTTERY TICKETS ARE FOR SUCKERS. John Curtiss is just another in a line of players the Twins have never given a proper shot.They only gave him 15 total innings spread over 2 season. I get that the Twins goal is to sign every declining free agent above tha age of 33 to one year deals, and I am not claiming that John Curtiss is the next coming of Lee Smith, nor that Daniel Ozoria has zero percent chance at becoming a servicable player (it is about 1.23%), just that the Twins front office is not doing much to prepare this team to be a competitive team in the future. 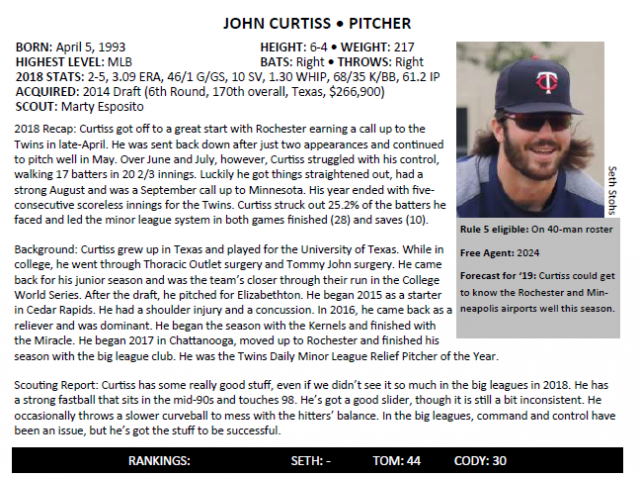 TO become a competitive team, we need a guy like John Curtiss to step up and become a viable piece of the bullpen.Maybe Curtiss wasn't the guy, but Parker isn't either even if he has a good year this year and if Curtiss wasn't the guy then we needed to plug in the other minor league relievers and see if they pan out. For those saying this is a lottery ticket: LOTTERY TICKETS ARE FOR SUCKERS. John Curtiss is just another in a line of players the Twins have never given a proper shot. They only gave him 15 total innings spread over 2 season. TO become a competitive team, we need a guy like John Curtiss to step up and become a viable piece of the bullpen. Maybe Curtiss wasn't the guy, but Parker isn't either even if he has a good year this year and if Curtiss wasn't the guy then we needed to plug in the other minor league relievers and see if they pan out. Hypothetically, what should they have done with Curtiss if they are already convinced he's not an MLB caliber player? 1.23% - So you're saying that there's a chance? The tough thing about projecting in Baseball is the uncertainty Rounds 1-40. In other sports you have more knowledge of what you're getting. In comparison, in the NFL, you know a first round guy should be a super star or a QB... QB's are the biggest question marks. 2nd-4th rounders will probably be decent players to stars, and 5-7 rounders will probably be around the next 3 years but there are no guarantees they will contribute much. They are your NFL lotto tickets. Comparing that to baseball, a first round pick in baseball is more like a 5th to 7th rounder in football. They will probably make it to AAA and you will hear about them for the next several years but there is no guarantee they will really ever contribute. Everyone after the first round is an even bigger question mark. In the NBA, you pretty much know what you're getting from the outset. Unless your the Spurs, the second half of the first round through the second round are gonna be role players. 1. Not sure how they are convinced that Curtiss isn't a MLB caliber player in just 15 innings stretched over 2 seasons. I get that they have a good idea, but to be convinced that is stretching it. 2. This is the same front office that had some idea that 38 year old Matt Belisle is a MLB caliber player and gave him the ball in 25 games (15% of their total games, much more because he was picked up mid-seaason) to a stellar 9.13 ERA. Again, why not give the ball to a young guy like Curtiss and Andrew Vasquez and see what they can do.YOu already know what Belisle will do.THen, if you give each of them 25+ appearances you can be convinced. The other thing, why do they have such patience with a guy like Matt Belisle, a 38 year old journeyman who will not impact the future of this franchise, and such little patience with John Curtiss, and no patience with players like Luke Bard??? It is baffling to me. Never bought a lottery ticket myself, but, I suppose if I were a MLB Chief, and given the sheer numbers of players coursing through the league, and the remote likelihood of success for any given one of them, I would collect a fair number of lottery tickets. Just because you never know who the next Mariano Rivera or Tony Gwynn or Trevor Hoffman is going to be.